A number of coastguard control centres, including the Northern Ireland base in County Down, could close as part of government cutbacks. More than half of the UK's 19 centres, which co-ordinate and manage rescue efforts across the UK, are expected to shut. 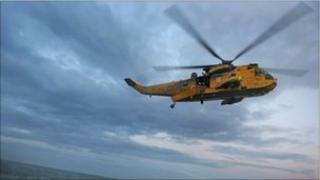 Ministers are also to press ahead with plans to privatise the UK's search and rescue helicopter fleet. The Department for Transport needs to cut its budget by 15% by 2015. According to the Daily Telegraph, eight centres will remain open and only three will operate on a 24 hour basis. Northern Ireland's headquarters in Bangor is among one of the 19 centres facing possible closure. It runs operations from Lough Foyle to Carlingford Lough and has dealt with more than 700 incidents so far this year. As further details are due to be released this week about the impact of the Spending Review, the coalition government is expected to announce a reduction in the number of coastguard control centres, arguing that as well as saving money, the move will modernise the service. A government source has also confirmed that the sale of the search and rescue service to a foreign consortium will be given the go-ahead. The previous government proposed that private companies should take over the running of search and rescue helicopters from the RAF and that the Sea King fleet - in which Prince William has been learning to fly - should be scrapped. This service is currently provided by the RAF and Royal Navy, plus civilian helicopters through the Maritime and Coastguard Agency (MCA). In February, it was announced that the 24-hour service would be run by private consortium Soteria from 2012, from 12 bases across the UK. The contract is worth £6bn over 25 years and will see the number of military aircrew reduced from 240 to 66, with civilian aircrew making up the shortfall.